Next Speaking of the power of music…. Meaning??? What? Gay marriage is fine? That marriage shouldn’t be controlled by the state because it is a religious institution. I’m saying that marriage should not be controlled by the State. I thought you, or at least Evan Hass, meant that this objection to legalizing gay marriage is invalid because it is a religious argument. But I agree with your point as clarified in the comments. 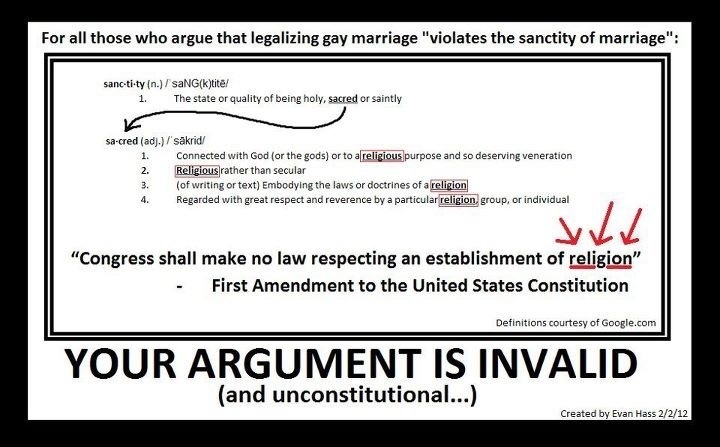 Marriage is an essentially religious institution and so it is unconstitutional for the state to control it. So… states that have gay marriage on the books… should take them off. States (such as Minnesota) that have amendments to support the traditional views of marriage… should press on? Two kingdoms may work fine in theory, but they will come to a head at some point. So, I’m just asking EXACTLY what you are saying. Because if you just keep saying marriage is something that is not controlled by the State… well.. IT IS. And they don’t seem to give much regard for the good Dr. Luther anymore. Gay marriage is on the books. And it will keep on expanding. So… should it? And if so, when that battle finally comes over “religious freedom” and “human rights”, do you think clergy that don’t perform gay marriages will eventually be in trouble? Marriage, as a religious institution, should not be validated by the State. ALL marriage laws, under the notion of the 1st Amendment and the Lutheran view of Two Kingdoms, should come off the books. Is your baptism validated by the State? If marriages are controlled by the State – then the state can controls who gets married and under what conditions one must marry, etc… The clergy member is acting as an agent of the State. As an agent of the State, you are required to give up certain civil rights. Think of State Workers and members of the military. Or Social Workers, or any other agents of the State. Marriage is sacred only before God. Well, what do you think? Should the State validate marriages and other institutions, ordinances, or sacraments of the Christian faith? I’m saying the horses are out of the barn. Is the barn government validation and control of God’s sacred institutions? So… I don’t think it’s a matter of insisting the government reverse course on a dime. It’s a matter of saying what the Church will do in response. We will face increasing pressure on this issue. Should the government decide not to listen to you and keep on deciding what marriage is and expanding that definition… the Church must be better prepared in that kind of pressure. We are in for some stormy seas in the next few decades, is my guess. And you are still asking government to reverse course when all I am asking is, simply, what if it doesn’t? We don’t have control over that (to an extent). So… as the Church… are we prepared? If it doesn’t, we are going reap what we have sown, I suspect. The Church seems hardly prepared for much, at least in the US. We are so sensitive to persecution, that I don’t know how direct challenges to the Church will be handled. As far as I can see the only way for Joel’s point to be executed would be for religious organizations to allow the government to define marriage as a civil legal term and each religious organization to devise new wording for their definition of a religion based union. In some countries I believe if you want a religious record you need 2 ceremonies. I think that is the only way to keep the civil authorities separate from religion. Our government is already too much into religious matters and some religions too much into government. Marriage is before God, not government.